Preparing the Next Bed: No-Till Style! There comes a time each fall and spring when we need to clean up the old, dead plant material and make space for new plantings for the following season. As you may know, I am practicing no-till agriculture on my farm. To see the blog post on how exactly I got started with that, read here: My Experimentation with Occultation. The process of doing no-till is quite easy. It just requires a bit of compost, some amendments, and your muscles! I am going to detail with pictures each step of the way on how I "turned over" a bed with spent summer flowers to make space for spring flowers. First, I cut all of the plants down at the base of the soil using a loppers. It is important to leave the roots in the soil as many beneficial microbes surround the roots and the roots will become food for other beneficial soil organisms. You can see that I made heaps of plant material and that I still have some straw mulch on the bed. Next, I piled all of my plant material on one side of the bed and the mulch on the other. I took up my irrigation lines (which were previously under the mulch), and laid them in the rows next to the one I'm working on. You can see my brown irrigation line on the left over a bed with landscape fabric on it, and the other line is laying on top of the plant material. You can take another step to rake the amendments to be smoother over the bed, but I'm not sure that is really necessary. Next, I add amendments. Most soils are deficient in calcium and minerals, so I've added a dusting of oyster shell flour (for the calcium) and a really light dusting of Azomite which is volcanic rock dust for the minerals. You can find these amendments at your local garden supply store or online at Peaceful Valley farm and garden supply. Now, this is the most important step! I place all of that plant material BACK on the bed. Say whaaaat? Yes. that's right. Most gardeners and farmers would haul this material off to a compost pile (usually along with the plants roots- Gasp!) which isn't all that bad if you're making good compost. However, plants soak up a ton of nutrients when their growing and in this method I'm detailing, we are returning the nutrients back to the soil right away. The beneficial soil organisms will chomp up and incorporate all of this plant material back into the soil directly. The only time I will not incorporate plant material directly into the soil is if there is a lot of powdery mildew on the leaves and stems. Usually this is the case with zinnias. It's best to just throw that plant material out rather than perpetuate the powdery mildew in the soil. The fun part, then, is stomping on the plant material. I want to crush it and make it as flat as possible. I will even take my pruners and snip wayward and thick stems so they lay flatter. Then, I add the compost! I aim for a nice 2 inches over all of the plant material. A wheelbarrow and shovel are necessary for this. The previous two steps could be interchanged as well. I have also had luck adding the amendments AND compost BEFORE putting the plant material back on the bed. However, I seem to think covering the plant material with the compost helps the organisms access it better. 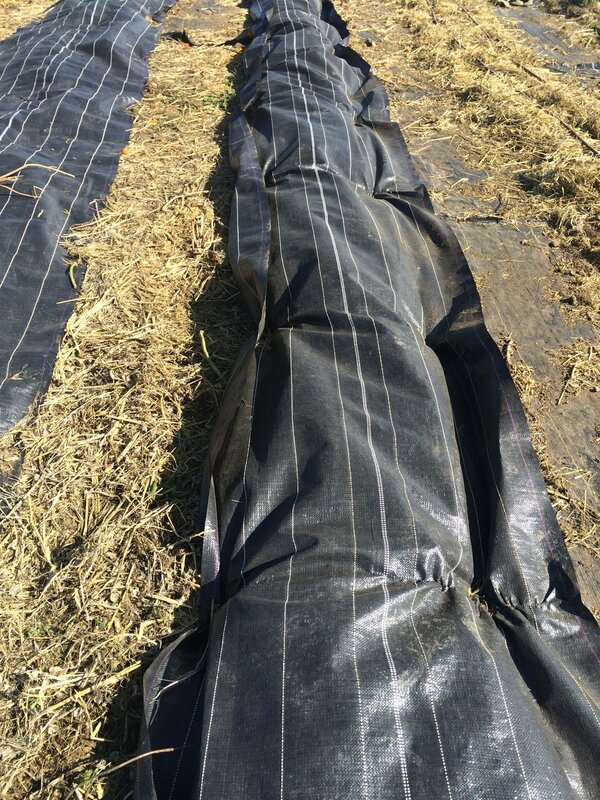 Lastly, I put the left over mulch back on top of the heap and place the irrigation lines on the very top (a foot apart) going straight down the row, using staples at the end to hold the lines somewhat taught and straight. Finally, I cover the entire row with landscape fabric. It's a tightly woven landscape fabric that lets air and moisture through which is very important! A company called De Witt sells this. Just make sure to search that it's "woven" landscape fabric. Plastic is not suitable. It is important to have moisture and air for the soil organisms to break down the plant material and to prevent rot, all while blocking the sunlight so that weeds cannot grow. I did this work right before the rains came, which is perfect. It is beneficial to have some water to speed the breakdown process. If you are not getting adequate rain, then you can always turn on the irrigation periodically. The landscape fabric is held down with staples every few feet, and that's it! I will leave this on for about a month. When I check on it, I should expect a nice layer of new top soil to plant into! Several flower beds on the farm in various stages of this process! Doing this method (which is called occultation) after every spring and summer planting will result in layers upon layers of healthy, rich soil on top of the heavy clay soil here in the Sacramento Valley. The goal of no-till agriculture in this case, is to farm on top of the clay, not to break it up. Layering with plant material, compost, amendments, and straw mulch season after season will build up the soil in a healthy and natural way. It just takes a little hard work and a lot of patience. The rewards of having magnificent plants and flowers are worth it.